End of the 1710s: he starts his career as a disciple of Asao Jûjirô, who gives him the name of Asao Motogorô I. He performs in Kyôto as a wakashugata/iroko in Kyôto theaters. 11th lunar month of 1727: he becomes wakaonnagata. 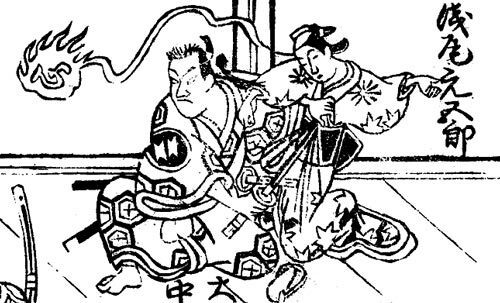 11th lunar month of 1730: Motogorô becomes zamoto and produces in Ôsaka the kaomise drama "Kunkoku Ôe no Kôbai". 1st lunar month of 1734: Motogorô's rank in the Ôsaka hyôbanki, wakaonnagata section, is jô-jô (superior - superior). He shares the same rank with Hanagiri Toyomatsu I and Mihogi Shichitarô. 11th lunar month of 1738: Motogorô plays in Kyôto the role of Daihachi's spouse Yaseno in Tomimura Takichi's kaomise drama "Ichi no Tomi Hôrai Yakata", which is produced by Nakamura Tomijûrô I at Kameya Kumenojô's theater; the role of Hirano Daihachi is played by Arashi Shichigorô I. 1st lunar month of 1739: Motogorô's rank in the Kyôto hyôbanki, wakaonnagata section, is jô-jô-hankichi (superior - superior - half excellent). 11th lunar month of 1739: Motogorô plays in Kyôto in the kaomise drama "Muromachi Dono Chôhô Denki", which is produced by Sanogawa Ichimatsu I for the nadai Miyako Mandayû; his stage partners are Yamanaka Heijûrô I, Ôtani Hiroji I, Sawamura Otoemon I, Tamiya Shirogorô, Haruyama Genshichi II, Onoe Kikugorô I, Shinozuka Kazaemon, Matsumoto Tomojûrô I and Arashi Sanshirô III. 1st lunar month of 1740: Motogorô's rank in the Kyôto hyôbanki, wakaonnagata section, is jô-jô-(shiro)kichi (superior - superior - (white) excellent). 5th lunar month of 1742: Chikamatsu Monzaemon's play "Shinshû Kawanakajima Kassen" is adapted for Kabuki for the first time, in Kyôto at the Kitagawa no Shibai; Motogorô plays the role of Danjô's spouse Matsushima [more details]. 9th lunar month of 1746: first Kabuki adaptation of Takeda Izumo I, Miyoshi Shôraku, Namiki Senryû I and Takeda Koizumo puppet theater drama "Sugawara Denju Tenarai Kagami", which is produced by Kiyosaburô at Miyako Mandayû's theater (the Kitagawa no Shibai); Motogorô plays the roles of Kakuju and Tonami [casting]. 11th lunar month of 1746: Motogorô becomes zamoto and produces in Kyôto the kaomise drama "Taihei Asahi no Shirahata", in which he plays the role of Okano; his stage partners are Fujioka Daikichi, Sakurayama Shirosaburô II, Shinozuka Kazaemon, Yamanaka Heijûrô I, Mihogi Shichitarô and Tatsuoka Hisagiku. 1st lunar month of 1747: Motogorô's rank in the Kyôto hyôbanki, wakaonnagata section, is jô-jô-kichi (superior - superior - excellent). He shares the same rank with Nakamura Tomijûrô I. 11th lunar month of 1747: Motogorô plays in the kaomise drama "Teikin Ôrai Manzoku Kagami", which is produced by Nakamura Matsubê I at the Kitagawa no Shibai and celebrates the shûmei of Sakakiyama Kôshirô II and his son Sakakiyama Shirotarô II; Others stage partners are Yamashita Matatarô I, Takenaka Heikichi, Fujioka Daikichi, Nakamura Kiyosaburô I, Nakamura Shirogorô III, Kasaya Matakurô I, Fujikawa Heikurô and Sanogawa Hanazuma II. 11th lunar month of 1748: Motogorô plays at Hayagumo Chôdayû's theater in the kaomise drama "Jidai Makie Chûshingura", which is produced by Nakamura Matsubê I. 11th lunar month of 1749: Motogorô plays at Miyako Handayû's theater the role of Hanzaemon's spouse Okyô in the kaomise drama "Imosegura Kogane no Ishizue"; his stage partners are Ichikawa Danzô III, Yamatoya Jinbê IV, Fujikawa Heikurô, Arashi Tôjûrô (he plays the role of the senior retainer Nambu Hanzaemon), Anegawa Daikichi I, Arashi San'emon IV and Ôtani Hirohachi I. 11th lunar month of 1750: Motogorô plays at Miyako Handayû's theater the role of Hanzô's wife Makino in Matsuya Raisuke I's kaomise drama "Kaikei Wagô Hanayakata"; the role of Todoroki Hanzô is played by Fujioka Daikichi. 1st lunar month of 1751: First Kabuki adaptation of the puppet theater drama "Tamamo-no-Mae Asahi no Tamoto", which is produced in Kyôto by Miyako Handayû at his theater; Motogorô plays the roles of Michiharu's wife Hagi-no-Kata and Oyachi [casting]. 6th lunar month of 1751: Motogorô plays in the same theater the role of Kambei's wife Chizato in the drama "Katakiuchi Deguchi no Yanagi"; the role of Muneta Kambei is played by Yamashita Matatarô I. 11th lunar month of 1751: Motogorô plays in Kyôto in the kaomise drama "Kaeribana Shinohara Gunki". 11th lunar month of 1752: Motogorô plays at the Minamigawa no Shibai the role of the keisei Hanaura in the kaomise drama "Hatsubaika Asahi no Minato", which is produced by Yamashita Matatarô I. 1st lunar month of 1753: first Kabuki adaptation of the 5 acts puppet theater drama "Yamatogana Ariwara Keizu", which is produced as a new year drama at the Minamigawa no Shibai by Yamashita Matatarô I; Motogorô plays the roles of Kingo's spouse Kaoyo and Hyôe's spouse Kishinami [casting]. 11th lunar month of 1753: Motogorô plays in Kyôto at Miyako Handayû's theater in the kaomise drama "Hade Musume Bandachi Yakata", which is produced by Yamashita Ugenta II and celebrates the shûmei of Matsumoto Tomojûrô II. Fall 1755: Motogorô goes to Ôsaka. 12th lunar month of 1755: Motogorô plays at the Kado no Shibai in the drama "Hyakumanki Tsuwamono Taiheiki". 1st lunar month of 1756: Motogorô's rank in the Ôsaka hyôbanki, wakaonnagata section, is jô-jô-kichi (superior - superior - excellent). He shares the same rank with Arashi Koroku I and Yoshizawa Sakinosuke II. 11th lunar month of 1756: Motogorô plays at the Ônishi no Shibai in the kaomise drama "Ômatsu Kyokusuke Tanzen Roppô". 1st lunar month of 1758: Motogorô appears on stage most likely for the last time, in Kyôto at the Hirano no Shibai, playing the role of Harukaze in the new year drama "Kume no Sennin Yoshino Zakura", which is produced by Kameya Jûjirô. We don't know what happens to him afterwards for he disappeared from the records. Asao Motogorô I was an important 18th century onnagata actor, who achieved fame for himself in Kyôto and in Ôsaka in the 1740s and the 1750s. He followed in the footsteps of his master Asao Jûjirô, the founder of the Asao clan and an outstanding female roles specialist. He excelled in keisei and karô nyôbô roles. He was the last onnagata of the Asao clan for his best disciple became one of the most talented katakiyaku actors in Kabuki history.